Even if you are missing an entire row of teeth, a custom-made denture can help renew the beauty of your smile and restore your oral function. Traditional dentures feature a gum-colored base and artificial teeth, and they are secured with suction, clasps, or dental adhesives. However, advances in restorative dentistry have led to the introduction of implant-supported dentures, which offer an unparalleled level of strength. At our Palm Springs, CA-area practice, Dr. Bruno Lemay offers both types of dentures in order to meet the diverse needs of our patients. To discover the type that is right for you, schedule a personal consultation at Desert Dental Alternatives today. 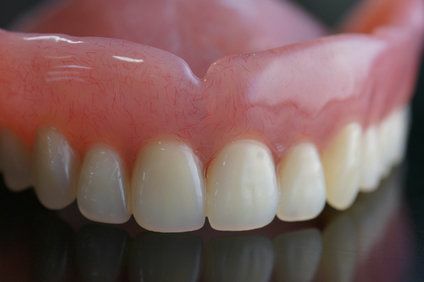 Conventional dentures rest on top of gums to replace missing teeth. These types of dentures are removable, typically more affordable, and available to virtually anyone with extensive tooth loss. To begin planning your traditional denture, we will first take detailed impressions of your smile. Next, this information will be used to create a wax-up model, which allows you to see the anticipated results and ensure treatment will achieve your goals. Your denture will then be custom-crafted at an advanced dental laboratory in the area. We have have worked with the same lab for nearly a decade because they provide high-quality dentures made from a range of aesthetically pleasing materials. Once your denture has been fabricated, which typically takes about a week, you will return to receive it and ensure a comfortable fit. Dental implants are small metal posts that are surgically placed in the jaw to act as artificial tooth roots. Although these dentures are typically more expensive and the process of receiving them requires more steps, many patients feel their unmatched benefits and exceptional strength make them a worthy investment. In order to qualify for dental implants, you should be in good oral and overall health. Additionally, you must have a sufficient amount of jawbone density to support the implant posts. If we find that you lack the necessary jawbone strength, we may be able to perform a bone grafting procedure to restore strength and help you qualify. During implant surgery, we will place mini dental implants, which are smaller than standard types, directly into the jaw. The implants will be left to heal for four to six months so that they can completely fuse with the surrounding bone. Not only will this implant-to-bone integration ensure your denture will never move out of place, it will also help to halt the bone atrophy that naturally occurs after tooth loss. Only implant-supported restorations can offer this benefit. When you return to our office for your final appointment, we will secure your implant-supported denture in place, instantly restoring the strength, look, and function of your smile. If you currently have a removable denture, we can convert it to an implant-supported restoration for enhanced stability and durability. Additionally, we offer same-day denture repairs. No matter if you choose a traditional or implant-supported denture, your restoration can be made from many different materials depending on your needs, desires, and budget. To learn more about the types of dentures we offer, contact our practice today.